A photograph records a man, perhaps in his mid thirties, with shoulder length hair, parted in the centre, and a neatly trimmed goatee beard. The man’s wide-open eyes are fixed just off to the side and seem to convey a fierce mania. To some the picture is silly; to others it is a terrifying portrait of evil. This image of Charles Manson, the ultimate hippie leader with a difference, began as a police mug shot and then became the cover shot for Life magazine. While the story of his life and times is well known (the arrival of each Manson ‘anniversary’ is marked with feature films, documentaries, magazine articles and more interviews) those once close to Manson — chief prosecutor Vincent Bugliosi, stars like Dennis Wilson, Sharon Tate, Doris Day — have come to be defined by their proximity to his potent presence. Manson = pure evil: Mike Tyson famously once stated: “Look, I’m a bad guy, but I’m not Charles Manson.” The advent of the internet has seen an explosion of Manson goods, trivia and opinion. The malevolence of Manson’s cult has entered cyberspace. Manson, because of the bizarre nature of the killings associated with him, now more than ever epitomises the notion of ‘apocalypse culture’. Yet despite the ubiquity of the legend of Charles Manson, Manson’s recorded music remains somewhat indistinct. It’s easy to forget that the picture described above is also a record sleeve — of one of the most infamous records of all time. Despite the internet Manson’s music still contains an ‘underground’ vibe. While everyone knows of ‘Charles Manson’ few have actually listened to his recordings. Music is the glue that sticks Manson to his friends, his fellow travellers, his ‘Family’, his enemies. It is through music that Manson connected (via the group The Milky Way) with Bobby Beausoleil (composer of Kenneth Anger’s Lucifer Rising soundtrack and according to Truman Capote “the real mystery figure of the Charles Manson cult”). Also with the Beach Boys, Neil Young and the Beatles. You could argue that the Manson story (to quote Beausoleil) “is all music”. Those that speak of Manson do so not with words but, according to David Felton and David Dalton, in “noises, guttural sound effects, gasps, shrieks”. The musicality of such expressions mirrors the coyote yips and yells that Manson and his followers utilised for communication while awaiting trial for murder. One of Manson’s purest legacies is his audio recordings. Manson is described as a ‘man with a thousand faces’ and this is reflected in his music. The many studies of Manson’s crimes claim to pay due attention to his musical output. But all too often the writer is distracted back to the vivid and still shocking killings that belong to the Manson legend. Music is the principle reason for why Manson is still a figure of intrigue and obsession and maintains the countercultural credibility that other killers patently lack. Manson’s association with the giants of rock music became a kind of creepy subconscious epitomising the time when rock met the counterculture, the moment when revolt rubbed shoulders with wealth. With the Beach Boys (through their drummer and hidden genius Dennis Wilson, who called Manson “the wizard”) this was a physical connection. With the Beatles it was psychic, imaginary. 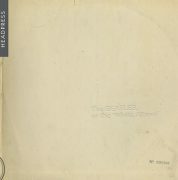 Manson deliberated over the Beatles’ eponymous 1968 LP (aka the ‘White Album’) with the studious devotion of a monk. It’s no surprise that he and his followers became obsessed with that record and that Beatles’ lyrics were repeated in Manson ‘sermons’ (“The glass onion is the door of water and the hole in the ocean is the pool in Death Valley”). Manson quoted The Ballad Of John And Yoko — identifying himself with the Christ figure in the song. The Manson reading of the ‘White Album’ was the first of many such fascinations with the record’s sound, image and content. Early Manson historians such as Bugliosi and Ed Sanders detected the eerie power of the record. Its minimalist blank white cover invites open interpretation, the kinds of experimental freethinking that the epoch — through mind-altering chemicals and radical head theories — invoked. The LP seems to speak to the future of rock music whilst detonating the idealism and egotism of the 1960s pop explosion. Importantly, both followers of Manson and Manson himself have noted how he did not otherwise draw on the music of sixties counterculture for inspiration; he was a disciple of the post war crooners (Sinatra, Perry Como, Bing Crosby etc) and like the composers of the ‘White Album’ drew on whatever felt right to express feeling and emotion through song. Charles Watson claimed that when he first listened to the ‘White Album’ with Manson in December 1968 he “ran from him” and devotion to the record was intense. Author Joan Didion named her account of the madness and paranoia of the age after the record (the most disturbing thing about the Tate-La Bianca murders amongst Didion’s LA tribe was her recollection that “no one was surprised”). Groups like the Rolling Stones packaged and resold violence and revolt in an immature and egotistical way. The Beatles’ form of the occult was more complex, hidden and more profound. ‘Lance Fairweather’ made an interesting comment when he said that: “If Abbey Road had come out sooner, maybe there would not have been a murder, maybe Sharon Tate would be alive today.” But then Abbey Road had its dark moments, too.